Weiler Room with private bath ensuite; queen size bed. 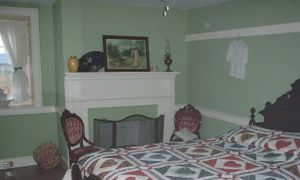 Myers Room (2 small rooms with 1 full bed and 1 single bed); with exclusive use of hall bathroom. NOTE: Discount given if the Amish and Myers rooms are booked together and share hall bathroom. Extra charge of $10 for rollaway for additional guest. $50 for two or more rooms. We now have the Square, to accommodate those who prefer to pay with a credit card.